Strong Peruvian genetics. 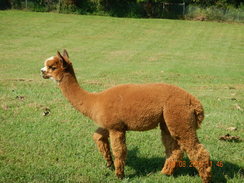 First place at Nationals 2yr Fleece competition 2007. 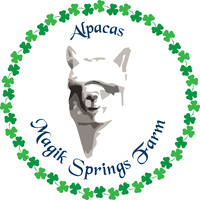 Gabriel is the first born on Magik Springs Farm. His handle is fantastic with excellent uniformity for which he won Fleece Blue Ribbon at Carolina Alpaca Celebration in 2015. His fineness is holding with his second histogram March 2014 hold his finest with micron 17.3 (see histogram). He unfortunately has an injury to his leg which has removed him from breeding stock. He is now a gelding but as a sweet boy makes an excellent pet.